Bryce Haper leads the league in WAR as of this writing. You can sort all of those columns and see where he stacks up with everyone, but what if you want to compare Harper to a player who isn’t right next to him on the list? Is it a hassle to compare Harper with Justin Upton? Voila! Your leaderboard is only a comparison of Harper and Upton. The URL is permanent, so you can share the comparison with other people and show them how much better Harper is than Upton at everything except base running. 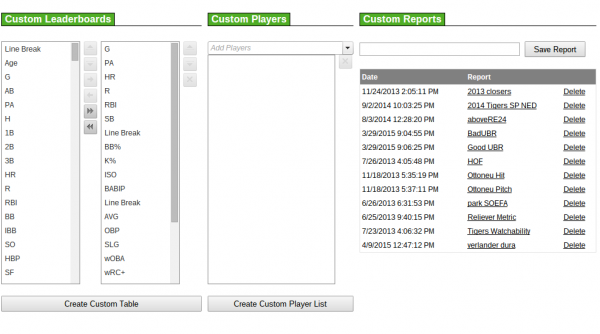 These reports can include multiple players, can be filtered and adjusted like any other leaderboard, and you can save them for future use. Now that we’ve done that, let’s think about where Harper’s season ranks offensively as of late. Bryce Harper was born in October of 1992, so the first baseball season of his life was the 1993 season. Can we figure out where Harper’s 2015 wRC+ ranks among single seasons since then? Wow, Bryce Harper is having the fourth best offensive season since he was born and the only three ahead of him are Barry Bonds. That’s very impressive, and something we learned using the leaderboards at FanGraphs. 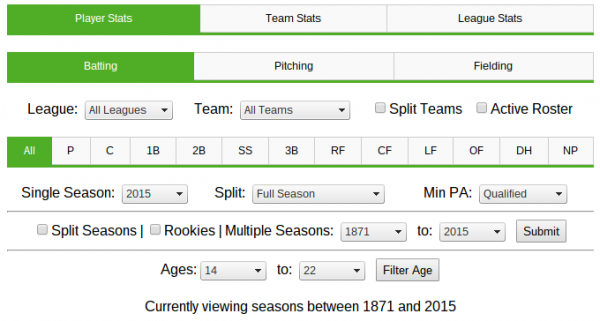 You can select any year range, change the PA threshold, look at multiple years instead of split seasons, isolate positions, and much more. Want to know who the best hitter was from 1947 to 1960 by OBP? You can do that. It was Ted Williams by a lot. There are a lot of other things you can do on the site, but we’ll just look at one more today. One of the amazing things about Bryce Harper is how well he’s performing at such a young age. 2015 is Harper’s age 22 season. Can we figure out where his bat ranks through age 22? Wow! Harper is having the second best offensive season by a player age 22 or younger in MLB history. That’s incredible. Even Mike Trout didn’t hit this well this young. There are all sorts of other questions we can answer with the tools on FanGraphs, but we’ll leave it there for today. If you have questions, feel free to ask them in the comments or reach me on Twitter. Other sites have great tools for answering these types of questions, but if you’re looking for information on a FanGraphs only stat, or prefer our setup for another reason, there’s usually a way to adjust the leaderboard to give you exactly what you need. We hoped you liked reading Using FanGraphs to Find Bryce Harper Facts by Neil Weinberg! OFF is a cumulative stat. So it’s based on a rate stat (actually multiple rate stats) and plate appearances. So as you play more with the same rate stat, it goes up, but it can also go down, unlike HR for example. But it’s not a rate stat because a .350 OBP is a .350 OBP regardless if it’s 1 PA or 1000 PA.